Whether you have to get up early for work, or just fancy a few more hours of daylight to make it through that to do list, these tips could definitely help! Ah, the age old night shower or morning shower debate. I personally night shower, and I save so much time in the morning as I have already washed my hair the night before. No more going out with wet hair or trying to fight with flatmates in the morning. So all I do in the morning is head to the bathroom, wash my face and clean my teeth. Whether these are clothes to go to work, lounge clothes or gym clothes, making sure you know where your clothes are so they are easy to slip on is a must. Otherwise, I would lounge around in my pyjamas for ages and never get out of bed! When you are first starting out waking up early, I recommend setting an alarm, and sticking to it. No more snoozing! This goes without saying, go to bed earlier, and you'll wake up earlier. I try to sleep, unless I am out, by about 10.30 or 11 if I am not particularly tired. Therefore, if you wake up at 6, you've had at least 7-7 and a half hours of sleep. I would sit for up to hours in bed scrolling through instagram, twitter and facebook. Limiting yourself to 5-10 minutes or trying not to at all is a good way to get out of bed and get started for the day! This may be pure psychological, but the more I think about being tired (and the more I keep saying it to people! ), the more I feel tired. Push through that to do list! Okay, so a few nights out isn't going to hurt, but try and keep a good bedtime routine. It will soon become normal! Make sure you have some time to prepare a nice breakfast. I think that an extra 5 minutes on breakfast is especially worth making it something nicer than plain cereal. A nice ripe avacado always gets me up in the morning! 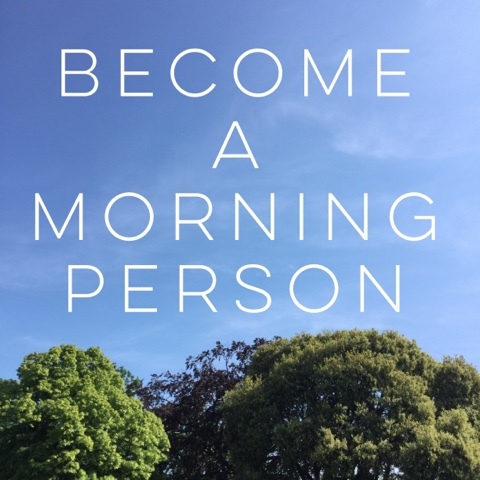 What are some of your tips for becoming a morning person? Now I'm officially in summer mode, I have been doing things that I didn't really have the time to do when I was revising. And this includes baking. Whichever way you say it, they always turn out great. Cheese, with raisins (and my flatmate eats chocolate ones?) or just plain, I can't get enough. The best thing is is that they don't use eggs, which I always forget to buy. 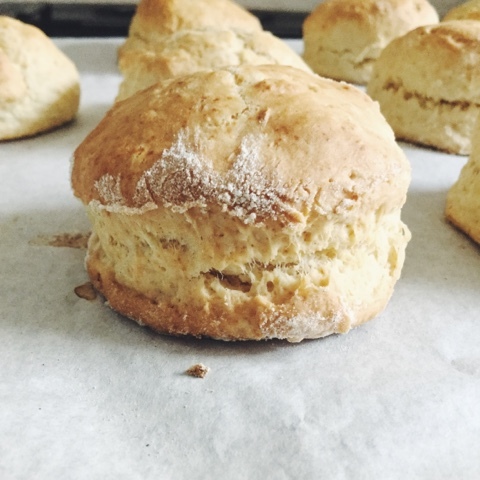 So I can still get your baking fix without going to the shop. Winning. 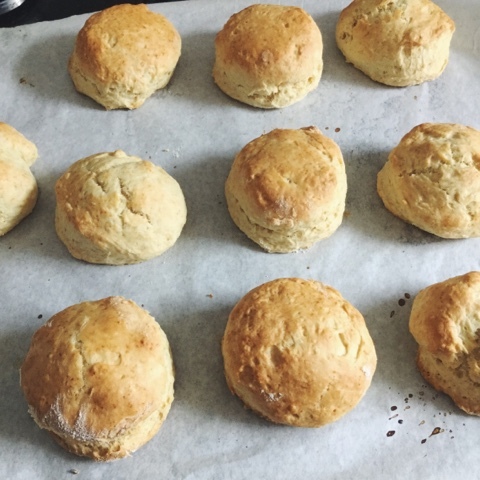 I used this BBC recipe to make these, and I think they actually turned out okay. Okay.. so they stuck to the grease proof paper a little bit, but I personally think it adds character and extra texture? 1. Add the butter and flour together and rub into breadcrumbs with your fingertips. Make sure all of the butter lumps have disappeared into the flour. It is better to do this with the butter at room temperature. 2. Stir in the sugar and the baking powder (plus any extras you want, whether this is cheese, raisins etc. I chose to just make plain ones). 4. Turn out onto a floured surface and cover it in more flour. I found the dough very sticky, but with a little bit more flour, it started to firm up enough to roll out. 5. Use a rolling pin (or a wine bottle covered in cling film works equally as well!) and roll out the dough about 2cm thick. 6. Use a cutter (or a jar, lol student life) to make them into circles and place on a greased tray. 7. Brush with some milk and place in the oven at 220 degrees (Gas Mark 7) for 12-15 minutes until golden brown and risen. On Wednesday morning I had my last ever university exam (and let's hope last exam ever), and I couldn't be happier that it was over. I've spent the last few days doing some life admin, watching a lot of Ru Paul's drag race and generally catching up on some much needed sleep. It seems only yesterday that I moved into my dingy halls, and now I have made friends for life. I've had more close friends than I ever have before, I've been to places I didn't think I would ever go to and I've been a part of and done some amazing things. It's true, that university has been the making of me, and I don't think I would be the person who I am today if I decided not to go. A bold statement, but I think it's true. I moved 3 hours away from Kent to the University of Warwick. Moving away was a very scary thought at 18, but it was the best decision I could have made. It made me appreciate my family a lot more, find out more about myself and give me the chance to meet new people. I feel so much more confident in myself and my abilities and has really taken me out of my shell. When you're thrown in on day 1 with a bunch of 19 strangers, you need to make the effort and put yourself out there. Fast forward almost three years later, I'm living with my best friends, had the chance to perform in musicals, sung with an a Capella choir, taken a show to the Edinburgh Fringe and hopefully be graduating with a good grade. 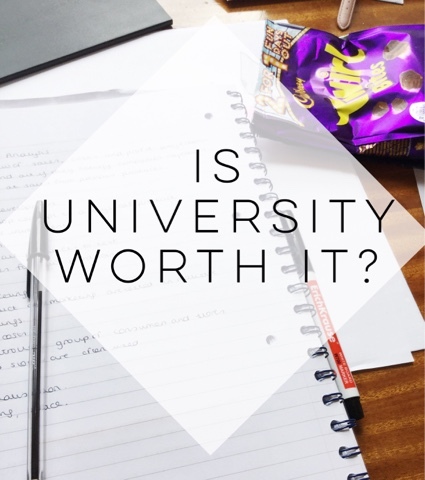 University isn't just about your degree. For me, my degree is only a very small part of my university career. I've talked about my degree before. So I didn't wholly love my course, and there were times, especially in final year, when I thought what's the point. Studying the history of science is not going to be useful for everyday life, and the workload and stress was getting to me too much. But I'm glad I kept going. Honestly, it was my friends and my extra curriculars that got me through. University isn't all peaches and cream. It's stressful, you'll fall out with people and you'll experience feelings you have never felt before. I've battled with my anxiety which began in my first year. But surrounding yourself with people who understand, and who will love you know matter what is the main thing. So is the debt and stress worth it? At the moment, I think so. I cannot thank this experience enough, and when I look back, I won't remember the times when I was worrying myself stupid or crying over my lack of dissertation writing. I'll remember the amazing memories, the people I met and the places we went. Some people 'find themselves' when they go travelling, I found myself at university. I look back at how far I have come and can't help but smile at the awkward teen who was too scared to introduce herself to a next door neighbor. Now, I'm ready for the last few weeks in Leamington before heading home and onto the next chapter.